When you are writing your own biography your aim is usually to make your skills and abilities known, showing those you show the reasons why you can be trusted. You display why and how you can deliver the required services to them and maintain a working relationship. You strive to show them or their team that you can collaborate and work effectively, that you can deliver you qualities and skills as you stated on the document you provided. All these are the targets and goals you hope to achieve when writing your biography. The hope you hold is that you can deliver all these qualities as accurately and as quickly as you can, without leaving out the vital info. Our service ensures that you have a properly expressed expertise statement prepared for your readers. We encourage interactive sessions between the biographer and our clients. You can get your biography written in three easy steps: A. Tell us about yourself B. Interact with your writer C. Review and Sign out you Biography. You get to consult our experts with in-depth knowledge of writing biography and utilize their skills to present you with a complete biography. We make sure that all your information is kept confidential and is put to relevant use for the success of your biography. This will give you an in-depth understanding about how our writers work to get the best possible results. After browsing through our website and looking through our competitive price plan and services offered you only have to click the ORDER NOW button to make the order for the package of your choice. This will redirect you to an order page where you can make an online payment with our secure online ordering system. This involves you sending all the information you would like to appear in your biography – this can be provided by simply emailing us a copy of your resume or sending all other information you may deem relevant for the creation of your biography. You can also send us a link to your website if you have any specific formats that you’d like us to adhere to. 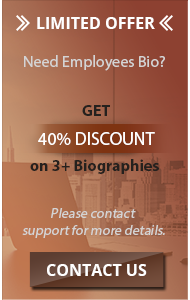 We send you a draft of the complete biography for you to review, update or edit 24 to 48 hours from the time you make payment for your order. The review process will continue until you are satisfied with the output of the work done. To ensure you are fully satisfied with the work in progress, the writer assigned to write your biography will continue to interact with you and iterate the process until you feel the best has been achieved. Your may request free unlimited revisions and free editing by the second expert when you feel that biography is almost done. Our writers ensure the utmost confidentiality and professional approach to information usage you provide and since we build your biography as the order comes in, you are assured that the final output is indeed genuine and will reflect all your skills and proficiency as they should appear. Placing your order today will put you among the best professionals whose skills have been successfully expressed!